Mr Jakobsen was at the Polar Park Arctic Wildlife Centre in Norway, and although many of its beasts are normally deemed dangerous they were surprisingly tender - even kissing his female friends. Guests are, however, warned not to look directly into the eyes of wolves. 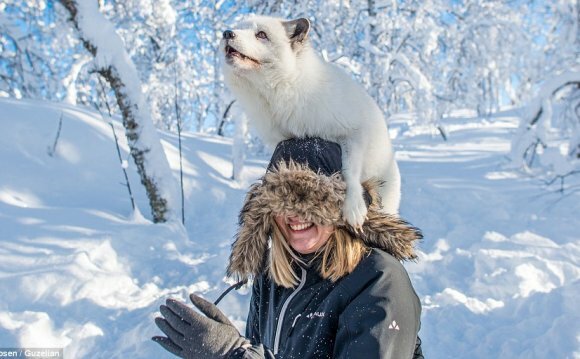 In his series of photos, the over-eager fox can be seen climbing on to the head of the photographer's friend Lene Kvandal as keeper Stig Sletten dangled treats over her head just out of shot. Mr Jakobsen said: 'On a lovely cold day with temperatures below minus 22C, I found myself inside the fence with arctic foxes. He added: 'I felt both awe and curiosity when we went in to the wolves, but tried to remain calm at all the time thinking about how I should conduct myself as a photographer and how wolves would react to the camera. Wolves are genetically afraid of humans which means non-socialised wolves in captivity are afraid of humans, and live under stressful conditions. Those at the park accustomed to being in close contact with humans, and there are no cages. Mr Jakobsen said: 'We must remember that the wolves in principle are very afraid of people, but that these two wolves who are in the photos are socialised to have relations with humans. Although arctic foxes are not endangered worldwide, the species is listed as critically endangered in Norway. Between 1998 and 2008 just 111 arctic fox litters were registered in the country, alongside another 130 in Sweden - with none at all in 2009.